OK, so I was telling my better half how uninspired I've been feeling lately and how I miss blogging and how I wish I had more time to bake and take pictures and all that. And do you know what he said to me? "Don't feel bad, statistically speaking, people who start a blog usually lose interest after about 18 months." Whaaah? Seriously? Is that what me and my little blog are? Just another statistic in a sea of abandoned blogs? Um, no. No, not in a long shot. I'm too stubborn for that. With that, I decided I would not be too hard on myself, always trying to come up with original and never before seen recipes and photos. I will blog for fun again and enjoy myself in the process. Because frankly, I haven't been doing nearly enough fun stuff since the kids started school. Routine has hit me harder than ever and I don't like it. So in the spirit of blogging for fun, here is the recipe for the muffins I made this morning, just because it was an off day from school and it was raining and I just felt like it. 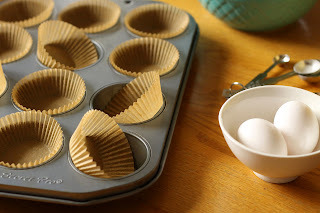 These are my go-to buttermilk muffins. I found it on a day I was looking for a recipe to use up the buttermilk I had in the fridge that was about to go bad. 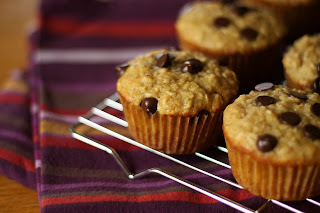 They were so tender and comforting that now, I buy buttermilk just to make these muffins. In a bowl, soak oats in buttermilk for 15 minutes. Stir in eggs, sugar, oil, applesauce and vanilla. 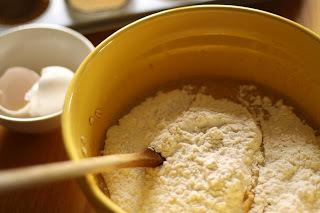 Combine flour, baking powder, baking soda and salt; stir into oat mixture just until moistened. Fill prepared muffin tin three-fourths full. 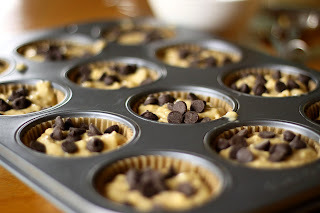 Sprinkle with chocolate chips, if using. 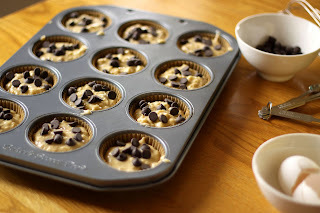 Bake in preheated oven for 18-20 minutes or until muffins test done. Cool in pan 5 minutes before removing to a wire rack. super, tu es de retour ! ça fait 4 ans que j'ai mon blog, j'ai des baisses d'intérêts qui durent quelques jours, mais comme j'ai toujours des recettes d'avance,...ça ne se voit pas ! lol ! Good for you! We all get sidelined sometimes because of work, family obligations and plain old burn-out. It happens to me a lot. We just have to remember why we started blogging in the first place - for fun, food and friends. BTW, those muffins look wonderful! Wish I had one right now to go with my coffee! 18 months, eh? i've beaten the odds, hooray! seriously though, i've missed you and your yummy dishes. these wholesome frostingless cakelets (also known as muffins) are great, as usual. oh my... love your virtual image!! amazing mix of pic's!! Just bookmarked this one. Yum! Great attitutude - keep it creative, interesting, tasty, and above all FUN! Thank for posting this recipe. I have some buttermilk in the fridge that's on the cusp. wow.. happy to come by to see the delicious baking here.. I think we all get in blog ruts every now and then. Glad you are picking yourself up out of yours. These muffins look spectacular! Oh these look so, so delicious! i made these last night and they're really good! the chocolate chips are nice touch. What a nice recipe to come back with. This is a really nice recipe. And because I am such a muffin person,e specially in the fall and winter, I know I will try these. These muffins caught my eye when you first posted them. I made them today, adding blueberries instead of chocolate chips and using pureed peach instead of applesauce (I had lots of leftover peaches and blueberries from the farmer's market). They were WONDERFUL!! I am so excited to make them again! Muffins were delicious! I used 1/2 cup of whole wheat pastry flour + 1 cup all purpose flour instead of 1 1/2 cups all purpose flour. And I used 1/4 cup soft butter instead of oil. I think the chocolate chips aren't optional. Whole family loved these! YUM. It surely is no coincidence that I have some buttermilk in the fridge that needs to GO. I linked to this on my weekly roundup - post is here. Thanks for sharing! Just wanted to say thanks for the recipe--I've made these a number of times since you posted this. I add 2 generous teaspoons (or one honest tablespoon) of baking powder, to make mine fluffier. I love them with blueberry applesauce, dried cranberries and chocolate chips. I usually do not leave a bunch of comments, but i did a few searching and wound up here at andthenidothedishes. And I do have 2 questions for you if it's allright. Could it be just me or does it appear like a few of the remarks look as if they are left by brain dead visitors? :-P And, if you are writing at additional social sites, I'd like to follow anything fresh you have to post. Would you make a list of all of all your community sites like your Facebook page, twitter feed, or linkedin profile? Excellent recipe. It turned out FANTASTIC. At first I thought it was a little less sweet but then when I bit into the chocolate chips it kinda balanced out. Thanks for this recipe, it's going to join my regular healthy bake rotation! I added some blueberries, and am going to tinker with it to see if I can stuff a bit more nutrition into it.